I have translated the Chinese classical poem into English, and May Ling from Toronto translated my English into modern Chinese. Take it as fun, for it is still a creative work. What plight would alter life? Tears rained the bells with blame and spite. My man in silk, how flimsy and callous! This entry was posted in Chinese Classic, poetry and tagged poetry tanslation on June 26, 2014 by wonkywizard. Nalan Xingde (1665 -1685, Qing dynasty), a Manchurian Chinese, was a famous lyrical poet. He was also the emperor’s personal body guard. A friend from Toronto forwarded two verses of the above poem to me. I was very impressed with the beauty of his lyrical verses. I took the opportunity to translate this lyric (ci poem) to share with my English readers. I am not Chinese educated, and I apologize for any error in mistranslation. For understanding, you have to read historical references, such as the love entanglement of the Tang emperor and his famous concubine, Yang. Liked holding on a helpless twig in solace. què dào gùrén xīn yì biàn. If one could hold one’s first impression of life afresh, one would not be affected by the changing vicissitudes of living; the wind in autumn would be a mere cooling pictorial bamboo hand fan. This poem was written by China’s well known poet, Su Tung-po (Sung Dynasty AD 1076). It was translated by me from classical Chinese into English. Again, Mdm. Liu May Wong, translated my English to modern Chinese. It is best you read the original poem, take our two translations as “interest”, and be aware that translations, no matter how good they are, commit injustices to the original. Enjoy the reading without making comparisons. Whence the next luminous moon appeared? Raising my wine-cup, to the blue sky, I cheered. Nor how the evening in celestial years, decode. The exquisite jade and jasper might damage was my concern. Dancing in its shadows, the transcendence was transience. Through its low lattices, it scattered in zillion. The fulfillment and separation were blameless. We only cherished to live longer and what we endeared. Despite living miles apart, perfection forever sought. This entry was posted in Chinese Classic, poetry and tagged Song Poem, Su Tung-po (double translation) on August 7, 2013 by wonkywizard. Nick Mansfield in his book on “Subjectivity” (2000, p180) concluded that subjectivity was about us, and could only be defined and known with “thorough analysis and critique.” Exploring subjectivity was discovery of the self in human existence through relationship, feeling, experience, identities and attributes, and would invariably touches on the interior life of “I”. The self has become the focus of many subjectivity theories in the West, and he advises us to have endless “open discussion” in a modern era so that the self gain some insight into each rather than anchor in any particular fixed theory. The Chinese has discussed such theories since the beginning of their recorded civilization. Despite this, Duan Dezhi commented that there was no exact translation for subjectivity into Chinese, and he proposed two aspects of subjectivity in Chinese lexicon, namely, zhu guang xing (ideas, concepts and consciousness) and zhu ti xing (body and material base). He elaborated that Chinese philosophy stressed more on attainment of universal human values in “compatible and complementary relationship”, mutual interdependence and interpenetration of the selves of the “I” and the “other”. 1. Jing: the core or basic text. This again is sub divided into two unequal chapters; the upper volume consisted of 30 hexagram (qua); and the second volume of 34 qua, thus a total of 64 qua. This basic text, extremely ancient, diverse in origins, appeared unsystematic and complicated, is basically used for divination, and appeared in earlier text and translations. It is interesting to note that hexagram 63 represented “completion” and the final 64 meant “incompletion” so that the cycle of change repeated itself ad infinitum for a different rebirthing interpretation. 2. This section consisted of “Ten Wings” (Zhuan) or Commentaries, consisted of seven sub-sections. In the middle is the Philosophical Guide (conspectus), or Ci Zi meaning attached verbalization. It was alleged to be written by Confucius himself, as evidenced by the sage’s quotation in the appendices. However, Daoism and Buddhism claimed their text was inserted in the commentaries, and Yi Jing was a hybridization of many prevalent teaching. The subjectivity in interpretation of text depended on the readers’ philosophical perspective. The rest, e.g. Shuogua (Explaining the Trigrams) are commentaries or appendices, explaining each trigram (yao) or hexagram (qua, or double trigram), either in its sequence, origin, order or relationship. During the course of Chinese history many commentaries were added into Yi Jing, at times enriching it, and at times, complicating it. Early Chinese feudal history and philosophical thoughts could be assessed through Yi Jing commentaries and appendixes. The scripture was considered by Professor Cheng as an “onto-hermeneutical” text, with the “purpose of helping us to understand the world both phenomenological and ontologically” simultaneously. Tu Wei Ming, quoted by Joseph A Alder, commented that the cannon was “anthropocosmic”, meaning dynamic interaction of humans and the natural world. Its symbolic nature was not designed for mere intellectualization, but more for apprehending the nature of reality, understanding, practice and action as one. There are three different versions of Yi Jing, viz. Liangshan, Guicang and Zhouyi. The latter is the current popular version. These three versions existed at different period of history, from pre Hsia, to late Zhou dynasty more than five thousand years ago. They differ in the sequence of the hexagram, and also in the method of deriving a hexagram. They also used different basic qua (hexagram) for style expression. For instance, Liang Shan used Gen, hexagram 52 as reference point, Guisang used Kun, hexagram 2; and Zhouyi used Gian, hexagram 1. Yi Jing is not written by any single person, or in any single historical period or dynasty. The hexagram was originated from the mystic sage, Fuxi. It evolved from the initial eight hexagrams into 64 hexagrams in late Zhou dynasty by King Wen and his son, the Duke of Zhou. During the subsequent Spring-Autumn period and The Warring States, Confucius and his disciples edited its philosophical Guide, Xi Ci and the “Ten Wings” (appended commentaries and Verbalizations). After the Han (206BCE – 220CE) and Song (960-1279 AD) dynasty, modifications and commentaries were amended or reconstructed. In Zhou Yi (Literally meaning Change in the Zhou historical period), Gian (heaven) and Kun (earth) are its two main doors. These two hexagrams are its basic, forming part of the trinity, namely, heaven, man and earth. Man resides in the space between heaven and earth. The Chinese character for man, ren, shows a picture of a pair of feet on the “ground” or earth image; a horizontal line across the middle means immense and a third horizontal line on the apex represents heaven. Each trigram has a representation of natural, cultural, familial-social and psychological phenomena, and also shows events and effect in temporal relation. Each hexagram (quo) is composed of two trigram stacked together, and each quo has its individualized image and interpretation. Each trigram is composed of three Yao; each Yao is either a straight line or an interrupted line. The straight line represented Yang, male, with its phallic symbol; the Yin, female, with a “river” in between the “shores”! Each line in the trigram, whether broken or unbroken, represents each of the trinity: heaven, man and earth, in their yang or yin manifestation. The changes in the yao, trigram and hexagram represent the laws of transformation and change. The word “yao” in Chinese consists of two crosses stack on top of one another, implying choices and options at the “cross road” or junctions of changes. Therefore, sixty four hexagrams consist of three hundred and eighty four yao. They interact and interconnect, nourish and block one another in ceaseless activities. Again, when Yi is impoverished, it undergo changes; when appropriate changes occur, flow then become smooth; when flow smoothen, it last (it has its own duration too) … the cycle of change repeats its cycle repeatedly in dynamic and voluntary ways. Each hexagram is a temporal frame, in cyclic alternations in incessant change. The temporal embraces knowledge of opportunity, ability to exploit the right timing, and ability to understand that opportunity has come and gone. The ethical aspect incorporates the Middle Path, and the ability to refrain from negative action. The temporal nature also points to a potential future state, which fortune tellers exploit it for prognostications, for Yi Jing, apart from its philosophical and psychological ontology also has a numerical and logical domain. The explanation of hexagram contained historical or mythical narratives, which helped belief in divinity and geomancy (Feng Shui). Divinity was also a language of Change, for the self had wish fulfillment to transform or to overcome obstacles. In the Ten commentaries, there are narratives or stories explaining the line-statements (yaoci), and qua or hexagram statement (quaci). Together they offer philosophical interpretation of the subject’s existence in a cosmological time frame, within a social and cultural construct. The self thus relate with the other in multiple dimensional ways, with awareness of the risks and benefits, and yet never certain of its outcome. “Heaven is high and honorable, earth is low and base; thus the positions of Qian and Kun are determined. The high and low being set out, the honored and lowly are positioned”. This simple introduction was often misunderstood that Yi Jing was patriarchal in nature and masculine dominant. It was looking at the subject with a vertical view of inflexible hierarchy, ignoring the horizontal aspect of duty, responsibility and order in family relationship. When there is personal order in the self, then the order is regulated in the family, which brings order to the state and peace and harmony in the world. The statement was a template for the importance of social hierarchy to achieve order in the person, family, community and nation; without order relationship would be in chaos, as observed in social turmoil or revolution or war. In Chinese philosophy, the yang and yin is not exact Cartesian divide, for in the “baqua” image, we saw each in the other. The Chinese word, good (“how”), is composed of female and a male in unison and completion; each stand in its right perspective position. Yang (nourishing) and Yin (supportive) were representation beyond sexual connotation. They might mean hot and cold, hard and soft, activity and passivity, liked a pair of chopsticks in action. Thus the introduction was interpreted as spatial and temporal relationship in human interaction and interpenetration with nature and nurture in the fluid state of becoming. The centrality of yin-yang alteration is also linked to moral principles and fulfilled in virtuous conduct. The significant lesson in Yi Jing is for human being to understand the constant and unceasing change in human existence, with its varied time and event perspective to consider. There are factors of fate, luck, opportunity, conditionality, connections and personal knowledge and cultivation to consider. The Chinese word for fate, ming, is written with three radicals (ren, yi, kou) on top of one another, which meant, the first thing a man has to bow is his destiny. The self has free will and autonomy and rationality, and yet, at times, he cannot always escape his destiny, for not everything is within his will and control. In the face of so many available options, choices could also be an illusion for the self. Nevertheless, the scripture advises, “When conditions are impoverished, adjust, adapt and transform to change for the better; when the right change is made, the Dao becomes functional again, and persist until it’s time the outmoded is replaced the new.” With such complexity, permutations and difficult language, Yi Jing is really not “easy” to read or understand. In the same vein, the self in human relatedness is not easy in existence, unless one can transcend all bipolarity values (fame and shame, pretty and ugly) limitations. Yi Jing is a didactic, moralistic and humanistic teaching, which promotes self cultivation based on benevolence and harmony of Confucianism. It provides insight to the experience of complexity, fragility and spontaneity of living in a world of contextually. The classic empowers the self to adjust and adapt to change, but also to acknowledgment human destiny. It is a teacher directing instruction, and the relationship between mentor and mentee are liked father and son. The phonic structure of Chinese language enables easy rote recitation for memory. In contrast, Foucault discourse is more student centered, where students are encouraged to exercise intellectual independence, do their own research and thinking and challenge existing scientific teaching. Foucault’s discourses are more diverse and logocentric and sexual; whereas Chinese teaching are more conservative and the self and the others have a common shared tradition and culture. Foucault teaching was about micro power dispersed everywhere in the “sociology of knowledge” level, where conduct impacted conduct in power relation, and he challenged epistemological status quo. In contrast, Yi Jing examined the subjectivity of the human beings from the theoretical ontological level, where the I-self seek harmony with the other self and with nature to achieve personal transcendence. Foucault had distaste for “meta narratives” and disliked his discursive discourse to be labeled, whereas Yi Jing was loaded with commentaries. 3.Yu Yih-hsien.2010.The Jijing,Whitehead, Time Philosophy .Zhouyi Studies(English)Vol6,13-31 Tunghai University, Taiwan. 4.Hall, E. Donald.2004.Subjectivity: The Neocritical Idiom.Routledge,Taylor & Francis Group. 5.Mansfield,Nick 2000.Subjectivity:Theories of the Self from Freud to Haraway.UK Allen & Unwin. Yao is either yang (unbroken line) or yin (broken line). This entry was posted in academic papers, Chinese Classic and tagged Book Of Change (Divinity), Comparison East And West, Michael foucault and Yi Jing, Primer of Chinese classic on August 3, 2013 by wonkywizard. A few years ago I have translated the above poem from classical Chinese into English. Mdm. Liu May Wong, translated my English into modern Chinese. Please take it as a literary game. The strange admission is I am not Chinese educated, and she is not well versed in English – a kind of “half baked” in our language proficiencies. However, for some readers, it may not be a bad idea to read her “modern” Chinese version, before you read the original, as long as the readers do not have the habit of making comparisons. In March 2013, Li Bai’s hometown, Jiangu, Sichuan, held a poetry recital of this famous Tang (701 -762 AD) poet. BBC called him “China’s drunken superstar poet”. This post is mainly to arouse interest for some readers, whether Chinese or non Chinese. And the return stream not reckon. A clear reflection of aging in shock. shines at dusk, shows snowy lines. A binge of three hundred cups will be observed. Only wine drinkers have their names sculptured. To procure more wine for our bout. The million miseries of bygone days. 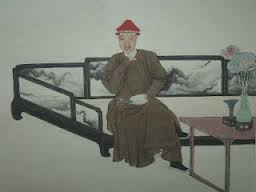 This entry was posted in Chinese Classic, poetry and tagged "China's Drunken Superstar Poet", Double translation., Li Bai and Wine, Tang Poetry on August 2, 2013 by wonkywizard. This poem, the primer poem from The Book Of Poem, was translated by me from Classical Chinese into English. My reader, Mdm. Liu May Ling, translated my English version back into modern Chinese. It is done for fun, and, I think, it is easier to read the modern version than the ancient. Apology to the purist minded. It has its own merit. That coos on the river ait. Well matched for courting gentlemen. For days and night they hold the ladies in their thought. And they toss around in bed. Pick and chose from either left or right. Tuning their harp and lutes in melody. Selecting from either left or right. This entry was posted in Chinese Classic, poetry and tagged Book Of Song (Poems), Double translation. on July 2, 2013 by wonkywizard. Poor for centuries, work as slaves and yet beg to eat. Free world, hand in hand, ensures their colonies never stand. Fit as world factory, toil like mules. Weapon withdraws, no longer plays second rate. Do not bow your life as describe. Refuse order, rise in mutiny. When impoverish change to open freedom’s gate. This entry was posted in Chinese Classic, poetry and tagged Chinese Pictograph, dagger and heart, destiny, eat, food, Ming, ren (tolernce), Yi Jing on April 5, 2013 by wonkywizard.